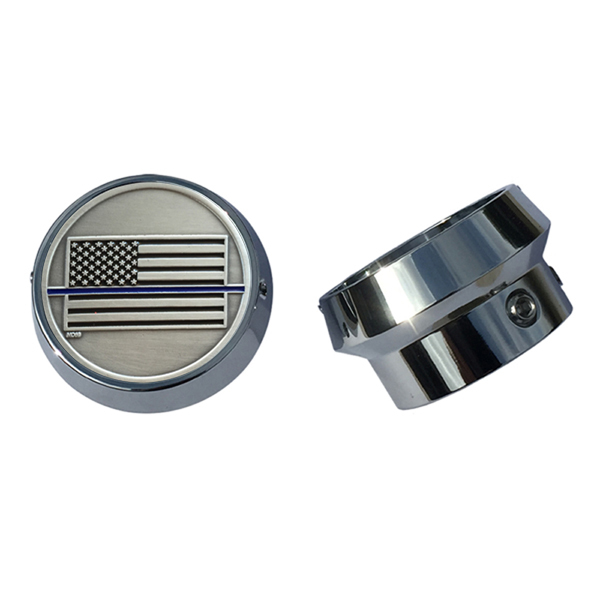 MotorDog69's Set Screw Front Axle Coin Mounts with “Police Thin Blue Line” coin. This is for both sides of your front axles. • This new brawny custom setup is for both sides of your front axles. Front Axle Coin Mount attaches to your own stock Harley front axle nut. • Fits all stock front axle nuts on the following bikes; All Touring Bikes 2008 to new, All Road Kings 2008 to new, All Softtails 2007 to new, All Dynas 2008 to new, Sportsters 2008 to new, and some V-Rod Models, if you have a question about fitment please ask us. • "Add a piece of your life to your bike" with MotorDog69's Challenge Coin Mounts. • Find out why thousands of our customers are riding with pride, when they mount something meaningful on their bike. • Now you can "Mount a coin, ride with pride, flip coin over, or remount a new coin, to get a new personalized look." • USA Patented and Engineered, Show Chrome Plated. • Bundle Includes; 2 Set Screw Chrome Harley Front Axle Coin Mounts, 2 Challenge Coins Shown, Set Screws, Allen Wrench, and Easy to Follow Instructions. Personalize Your Ride Today! • Kit Benefits; Easily mount and remove challenge coins to personalize your own stock Harley Front Axle Nut, to hide the bolt. • You can loosen one of the set screws in order to flip the coin over to display the other side, or remount a different coin, to get a new personalized look. Coin mount attaches to your front axle nut with dual set screws. • The feeling you get when you mount a personal challenge coin on your bike, is something only our customers know. • MotorDog69 Is The Inventor and Designer Of The World's 1st Adaptable Challenge Coin Mounts For Motorcycles And All Vehicles. "Mount a coin, ride with pride, pop coin out, remount a new coin, get a new personalized look."